This was such a fun piece to paint! I created it a couple of years ago from reference photos taken in a parking lot during one of our art shows. We were in Lexington, Michigan at a show, and our booth backed up to the parking lot. It was a beautiful, crisp, sunny day and someone parked this immaculate, shiny Harley right behind us. 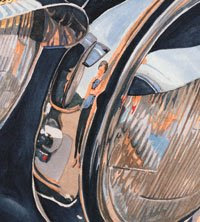 I really love to paint reflective surfaces so I ran out with my camera to take a bunch of reference photos. When I came back to my studio I noticed my reflection in the chrome of all the photos. I didn't want to paint the reflection literally (with the camera) so I tweaked the image a little. I told my husband that this is the only picture we will ever have of me as a tall, thin woman. In person I am only four feet, ten inches tall! 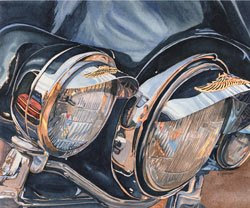 This painting won an award at a show a couple of years back in Florida. It is still available as are limited edition prints. Here is a close up of the area with my reflection in case you had a difficult time seeing it!